Dr. Pawan Kumar Kansal, MBBS, MD(Internal Medicine) is the Medical Specialist at Mukat Hospital, Chandigarh. Prior to that, he was associated with Government Medical College, Sec 16, Chandigarh as a Medical Specialist. Dr. Pawan Kumar is an alumnus of Government Medical College, Patiala, from where he has achieved his undergraduate Degree in the year 1970. Subsequently, he joined PCMS & worked at various places at Kapurthala, Sangrur and later shifted to General Hospital Sec 16, Chandigarh. At General Hospital, Sec 16 Chandigarh , he worked in the department of Anaesthesia as a Medical officer for a tenure of 10 years. Then in 1982, he went on to join Government Medical College, Patiala as a Registrar in the department of Medicine and completed his post graduation in Medicine from there. 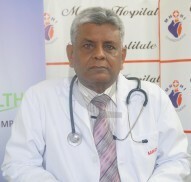 He has also achieved his training in Ecocardiography from Moolchand Hospital, New Delhi.